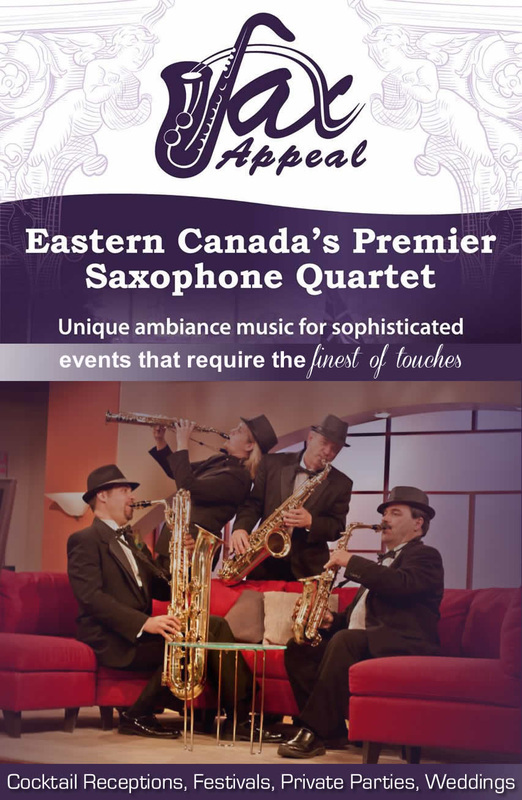 Known as Canada’s Premier Saxophone Ensemble, Sax Appeal is a unique professional saxophone ensemble (comprised of a Soprano, Alto, Tenor and Baritone saxophone) located in Ottawa, Ontario, Canada. Excellent musicians and a great variety of musical styles suitable for any occasion are hallmarks of Sax Appeal. Equally comfortable playing any musical genre ranging from jazz to classical to literally everything in-between, the versatility of this saxophone ensemble is unmatched. From wedding ceremonies, cocktail receptions and diplomatic functions, to birthdays, retirement homes, Christmas parties and festivals (such as the Ottawa Jazz Festival and the Gatineau Hot Air Balloon Festival), a Sax Appeal performance will leave your guests in awe. Ottawa Talent Agency is pleased to represent Sax Appeal and we invite you to inquire about a quote for your next function.